Me and beets? We didn’t always get along. I didn’t like how they were dark and mushy and tasted of tin. You see, ed I had never had the pleasure of tasting a fresh beet perfectly prepared. I was only acquainted with beets from a can. These days, me and beets are like BFFs. I like them raw and crunchy in a salad, or tossed with pasta and gorgonzola. But most of all, I like them roasted. 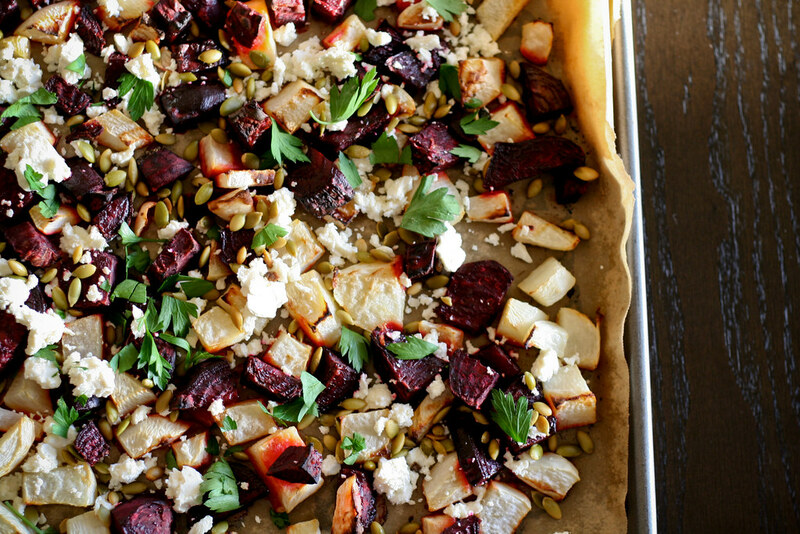 Beets are at their best when roasted. Kind of sweet and starchy and earthy. The perfect fall side dish. 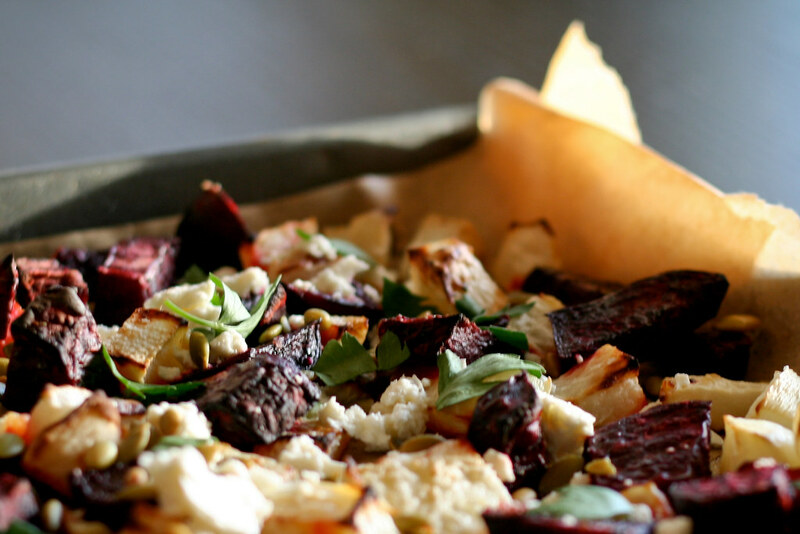 For this recipe, I roasted beets and parsnips with a little olive oil and salt. After they were browned and toasty, I sprinkled them with crumbled feta and crunchy pumpkin seeds. I loved the contrast between the roasted vegetables, the sharp cheese and nutty seeds. It was a delicious side and we ate far more than we should have. A side note for you runners out there: we had an excellent long run the next day and I’m pretty sure we got that good energy from these beets. 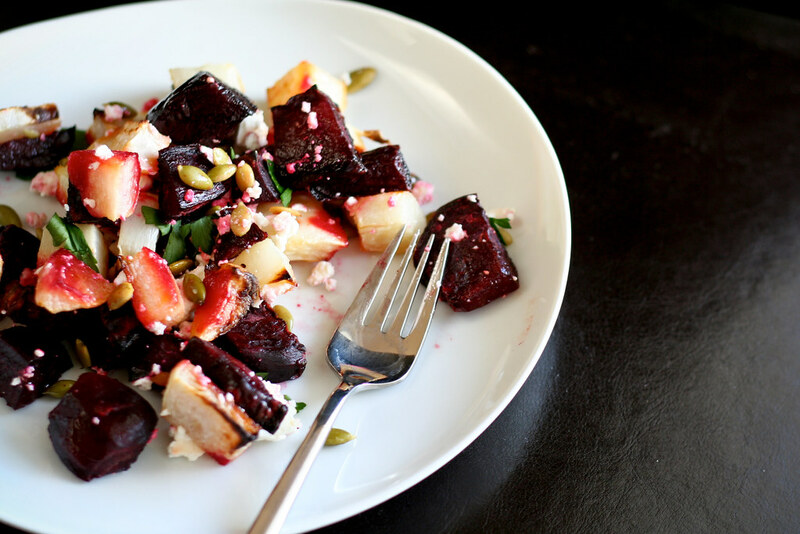 So, if you and beets aren’t on speaking terms, I suggest a reconciliation with this recipe. I’m sure you’ll find that you and beets get along just fine. Preheat the oven to 350° and line a cookie sheet with parchment. Toss the beets and parsnips with the olive oil and salt and place on the cookie sheet in an even layer. Bake for 30 – 40 minutes, or until the beets tender and slightly browned. Remove from oven and sprinkle evenly with feta, pumpkin seeds and parsley. I’m not awfully fond of beets, but you do make them look tasty here. I don’t recall ever seeing fresh beets at the market, though..I wonder if I could find any? I always like beets when I eat them, but I don’t typically go out of my way to do so. There always seems to be something else I’d rather eat. This recipe might make me seek them out, and might convince the boyfriend to eat them too! I have tried beets and so far still don’t like them but I’m going to keep trying! Maybe it’s that I’ve only had canned? I just joined a CSA so I’m looking forward to getting fresh ones and trying out some various recipes and this one looks perfect! Beth – I just get mine at the grocery store. They have loads. Rachel – My husband scarfed them down. No one can resist cheese! I love beets! I only discovered the fresh variety in the last few years. I’ve never tried canned (gross!) but we used to buy the pre-pickled ones at the store…defo still have a soft spot for those. This looks like the perfect autumnal side dish – if feta and parsnips are involved then I am ON BOARD. Great photos too! i have not had beets since i was a child! I have to try this, looks SO good! I don’t think I like beets either (hated them as a child) but this recipe looks so good I’m going to try it. I’m going to blag a beet or two from my allotment buddy and see how it goes. So yummy I thought about having the leftovers for breakfast! Thanks for the great recipe. I never would have thought of the pepitas; they were a nice touch. Wow, these sound and look so good! Thanks for sharing your recipe! This was so yummy! Thanks! I love your recipe and the combination of ingredients. Looks very appetizing.